Visit Jeep for more information on the Jeep Grand Cherokee. emission requirements and Clean Fuel Fleet Certification (CCF-LEV) in all other 45 states. Clean Fuel Fleet Certification (CCF). Rear Multi-link rear suspension, coil spring, twin tube shocks (including load leveling for towing), aluminum lower control arm, independent upper links (tension and camber) plus a separate toe link. (a) Three-channel ABS standard on 4x2. Four-channel ABS standard on 4x4. (a) Gross Vehicle Weight Rating. (b) Curb weight includes standard equipment and full quantities of fuel, lubricant and coolant. (c) Payload is the maximum allowable weight of driver, passengers, cargo, and options, rounded to the nearest 10 lbs. (5kg). (a) All models can tow trailers up to 5,000 pounds with the addition of a trailer hitch. For towing heavier trailers up to the Maximum Trailer Weight Ratings shown in the Trailer Towing chart, the vehicle must be equipped with the Trailer Tow Group Class IV for the 5.7-liter engines for North America. (b) Maximum Trailer Weight = GCWR - Curb Wt. with hitch - 300 lbs. (allowance for driver and passenger) and must be decreased by the weight of optional equipment, cargo and additional passengers. Maximum trailer weights shown are rounded to the nearest 50 lbs. Tongue weight should be 10-15% of loaded trailer weight but may not cause vehicle to exceed GVWR or GAWR. Load equalizing hitch recommended for trailers over 2,000 pounds. 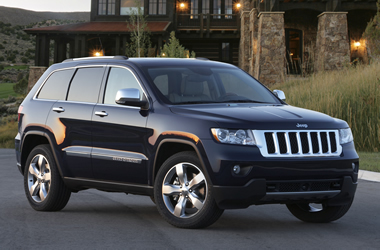 Get a Price Quote on a 2012 Jeep Grand Cherokee.